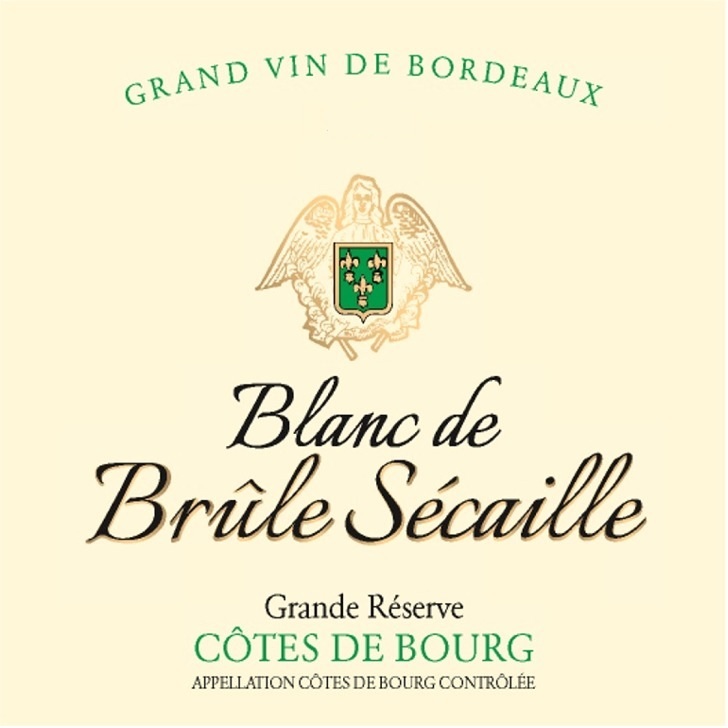 Brulesecaille Blanc Grande Reserve is made from 75% Sauvignon Blanc, 25% Sauvignon Gris. Pale yellow color with a green tinge. Elegant bouquet with notes of citrus and grapefruits. Smoky notes or fresh nuts aromas. Intensive fruity and elegant flavors of citrus lemon, grapefruit, elder-flower, and gooseberries. Fruit-driven fine structured finish with terroir expression, acidity is high enough to maintain the extended finish. 75% Sauvignon Blanc, 25% Sauvignon Gris. Drink over the next 3 years. Average age of the vines is 25 years. Manual harvest from September 19th-20th 2016. Direct press at low pressure (whole cluster) with low amount of SO2, settling at 10°C. Addition of yeast and alcoholic fermentation in casks 400 liters. Raised on the lees for 6 months with regular batonnage (stirring of the lees). Fish, seafood, white meats, fine goat cheeses. Vignobles Rodet Recapet Estate Vignobles Rodet is owner of Château Brulesecaille and Château La Gravière in the Cotes de Bourg AOC. Jacques is a viticulture engineer (graduated from Bordeaux Science Agro) specialized in Nature Protection and focuses viticulture. Guillaume (graduated from DUAD Bordeaux) oversees vinification operations in the cellar. Jacques believes in using more natural methods to encourage ripening; he utilizes canopy mangement techniques, removes leaves and thins bunches as necessary. In September 2016 the estate received High Environnemental Value level 3 Certification. This covers mainly four key areas : biodiversity conservation, plant protection strategy, optimized management of fertilization and water management. Date Founded: 1840 Owner: Martine and Jacques RODET Winery Philosophy: Making great wines, using both modern winemaking and traditional viticulture. In 1924, The RÉCAPET family bought Château BRULESÉCAILLE. In 1974, the estate was handed down from M. Pierre RÉCAPET to his daughter and son in law, Martine and Jacques RODET. It is now included in a structure named G.F.A. RODET RECAPET. Winery Acreage: 74 acres (30 hectares) Winery Production: 12,000 / 9L cases Varietals Produced: 54% Merlot 25% Cabernet Sauvignon 9% Cabernet Franc 4.5% Malbec 7.5% Sauvignon Blanc and Gris Winemaker: Jacques RODET (graduate agricultural engineer) and his son Guillaume. Located in the heart of the Côtes de Bourg region, BrûleSécaille is a 28 hectare vineyard classed "Cru Bourgeois" since 1868. The name ‘Brulesécaille’ derives from Gascon; “Bruler” means “to burn” and “sécaille” is from the latin “secare” meaning “to cut”. According to tradition, we burn the cut vine branches during pruning. Brulesécaille is situated on a clay limestone outcrop. This particular soil composition dominates the Dordogne valley and allows excellent drainage in winter and spring. The vines enjoy excellent sun exposure, encouraging consistent ripening vintage after vintage. Because the vineyard survived the particularly hard winter frosts of 1945, 1956 and 1991, there are some significant older vines, up to seventy-five years old. Château BruleSécaille : 23 ha Château La Gravière : 5 ha Château YON St Christophe : 2 ha Every care is taken by Jacques RODET (graduate agricultural engineer) to respect nature, maintaining a biological balance from growth to harvesting in particular by thinning out leaves and excess grapes in order to produce a natural wine. The grapes are picked by hand. Great care is taken with the manual picking over, de-stemming and crushing. The wine needs a long fermentation and maceration period (3 to 5 weeks) in stainless steel tanks, controlled by an automatic temperature monitoring system, to ensure a rich full-bodied wine.